You come home from work, and discover a letter addressed to you. The thick paper envelope appears rich and bears a wax seal. The wax is a deep shade of purple. The stamp cut is not precise but looks like a tree with curved branches, that tapers to a point. You break the seal and scan what appears to be an airline ticket, 2 bank cards, hotel reservations, and a formal letter. The letter appears to be addressed to you, but surely it can’t be real. Who is James Churchward? Must be a scam? Is it? You do some research. The banks are real, the funds loaded. The ticket’s real. Both reservation and lawyer are in the UK. Winning Vote: 67% Make arrangements. 33% Hop on the next plane! It’s a big risk disrupting your entire life to go on this adventure, but with roughly 20k in credit already it’s worth the risk. Fortune favors the bold. You pack your meager belongings, set up a car service and bump up your flight. As you wait in the airport, you notice something. Just out of eye shot a man stares at you with vehemence. Whenever you look straight at him, his face is passively looking off in the distance. You can’t catch him. As you get up to confront this guy, you hear your name called by the gate desk. Turning back you find the man’s seat empty. You walk around the terminal, quietly asking people if they saw the pale man in a dark coat. You only get strange looks. You enter a bathroom, finding empty stalls. An electric buzz crackles, & in that instant of darkness, he appears & is gone. 25% Is there a drink limit? Sitting in 1st class is abnormal. You even avoid the $.20 charge for extra bbq, even though those nuggets demand the sauce. 16% Oh hey a skymall! Getting drunk to Grown Ups 4, you fall asleep with a Skymall for a blanket. That’s right! You did all the things! The jolt of the plane turbulence wakes you up, lightning rumbles, & you remember you’re in a tin can flying over the Atlantic. You recline back in your chair. Flirty time is over. You contemplate watching Spanglish 2: Spangle Harder, but instead get up. The door to the restroom shows occupied. You stand waiting for a relief of some of that pent up liquor. Lightning crashes. You stare out the window into the storm. Lightning flashes. The man stands silhouetted on the wing, staring at you menacingly. 20% Freak the fudge out! 15% Reversi Steward Save Me! You check on your sweaty friend. He’s groaning, so still breathing, & he’s moving his limbs. All good signs. Unless you crash. As you bear him the plane lurches once more. A lady running the aisle is flung into the overhead & something in her snaps. The roar begins to diminish, the plane rights itself. The lights return, but the crying from passengers continues. The crew responds to the injured. You’re returned to your seat. The man you saved is safe, thanks to you. The plane lands. Representatives report that faulty paneling must have broken off allowing a lightning strike on the wing to cause damage. You arrive at your hotel with fortunately little supernatural phenomena, save for a suspiciously heavenly street Kabob. You set out to get arms. 1st stop gun st.. huh.. not much of that here. Quick phone search suggests not much here IS legal. You’re now protected from…vampires I guess. You walk around, hidden stick poking your ribs, but you feel more in control. Cue 90’s shopping montage. You’ve never been more stylish. It’s easy to forget about eldritch horrors when you look this good. You spend the week seeing sites, eating well, enjoying a life you’ve never indulged. And what’s best, no unfathomable horrors. Smirking, The agent points up at a wall showcasing prior clientele. Ooh Martin Short, and is that Busta Rhymes? Seems legit. Winning Vote: 49% Do any, specialize occult? 25% You’re no Busta. Leave. Your requests met with a blank annoyed stare. Not only are you no Busta, but your humor apparently lacks the tact of Mr. Short. Hailing another Cab, you leave for Metraux & Assoc. As your cab pulls away, another car pulls out half a block behind you. The driver shrugs, as he makes his right turns. 3 turns later and the “following” car keeps straight. Must’ve been a fluke. Mr. Digby offers you tea. With a startled realization asks a Mr. Kanta seated behind you the same. You didn’t notice him before. Winning Vote: 86% Inspect Mr. Kante. 0% Whoah! Who’s this guy!? He appears immaculately groomed, & accustomed to opulence. His clothes are impeccable. His smile never touches his eyes. An excellent cup of tea drops from your hand, much to the dismay of Mr. Digby. He does not press the matter though. Tie Vote: 44% Go on…. You apologize profusely for the tea spill, as Mr.Digby politely assures you that 18th-century Turkish rugs are quite durable. There was 1 final inheritance item to be disclosed. A company has been kept on retainer managing all your assets, & holdings. Mr. Digby uncomfortably describes a chest awaiting you in the next room. You sense a shift in Kanta’s interest. It’s a large diverse portfolio of investments, holding major interests in many firms. Most in tech. All managed by C&C Assoc. There are 2 private airports & 2 marinas covering each hemisphere. Several nautical & airborne vessels. Managed by C&C Assoc. Winning Vote: 67% Creep still creepin’? You look back to Mr. Kanta. Still being a weirdo creep back there. Has he blinked yet? He’s probably not blinked yet. C&C Associates currently manage all your holdings. They’ll continue to do so, with you having final say on all matters. They will henceforth, advise you on legal, financial, & security matters, subject to a renewal of services 5 years hence. 25% Did you say legal help? 13% Did you say finance help? C&C Associates will provide security advisement & protection to you. Hand off to them will occur at tomorrow’s meeting. 20% Did you say legal? 20% Did you say financial? Winning Vote: 67% And who might that be? 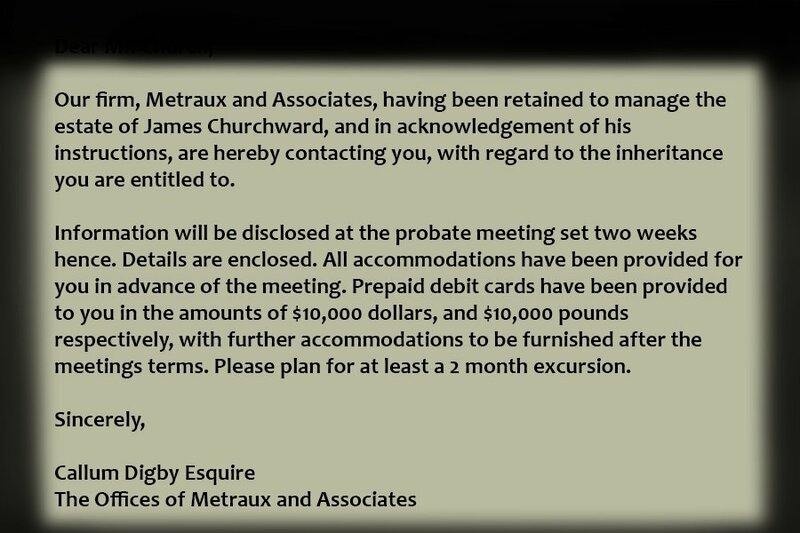 Mr. Digby informs you that he is not at liberty to say as part of the agreement terms of the inheritance. He apologizes. Ever since you started this journey, it has been nothing but wierdness. Maybe if you walk away the wierdness goes with it. Digby is stunned. He repeatedly implores that you’d be mad to walk away from literally more than some nations are worth. You hail a cab with instructions to get back to the hotel. The cards should get you back home with a couple months rent. The elevator opens on your hotel floor. Your thoughts are a jumble since your decision. Did you really give up 42 billion? As you stare down the hall the light at the far end goes out, the next follows. You thought you were done with this. Standing motionless, caught between the decision of how to flee, the light above you goes out, as does the one behind you. Needles. Needles crawling up your ankles, your thighs, leaving a burning swath of pain as it crawls up you. Enveloping you. Whispers speak in unknown tongues, increasing to a roar. You don’t scream. You don’t want to let the needles and flame in. As you feel sanity start to slip away from consciousness, a golden rectangle appears off in the distance. The elevator opens. You pull your feet from a morass of nettles. Each step pulls, as if mired. Falling forward slowly your hand hits the ground. Fire rolls up your arm, you reach forward as the crawling agony rolls over the back your head. God it’s coming for your eyes. An angel steps out of the rectangular halo set in the vast void. He extends a hand to you and you reach for it. He takes aim at you. At this distance he can’t miss. He fires. The bullet enters your skull. Light burns across your vision.